In this article, Robert Prechter outlines Elliott wave patterns in several non-financial data series, including US tobacco use, union membership and homicide levels in New York City. The insight that Elliott waves unfold in collective behavior has significant implications for the ability of sociologists, policy makers, and other researchers to forecast these trends. Here is an excerpt of the February 2015 article. Figure 17-1 in The Wave Principle of Human Social Behavior presented a chart of the annual per capita sales of cigarettes in the United States. It traced out a “classic Elliott wave advance” over six decades and then reversed. Figure 1 shows an update. Since then, we have found the same five-wave structure in other non-financial data series. Look at Figure 2 and see how much the rise looks like that in Figure 1. This nearly identical formation occurs over a period of eight decades in the annual tally of union membership in the US. Figure 3 displays another excellent five-wave form, this one in the annual tally of homicides in New York City over a period of two centuries. Here the fifth wave sports a clear five-wave subdivision, too. None of these data series is causal to any of the others. Each one traveled its own path. Economists and sociologists have attempted numerous explanations in retrospect for each of these reversals. The text that originally accompanied Figure 1 cited an article offering no fewer than six post-hoc hypotheses for why people were smoking less. 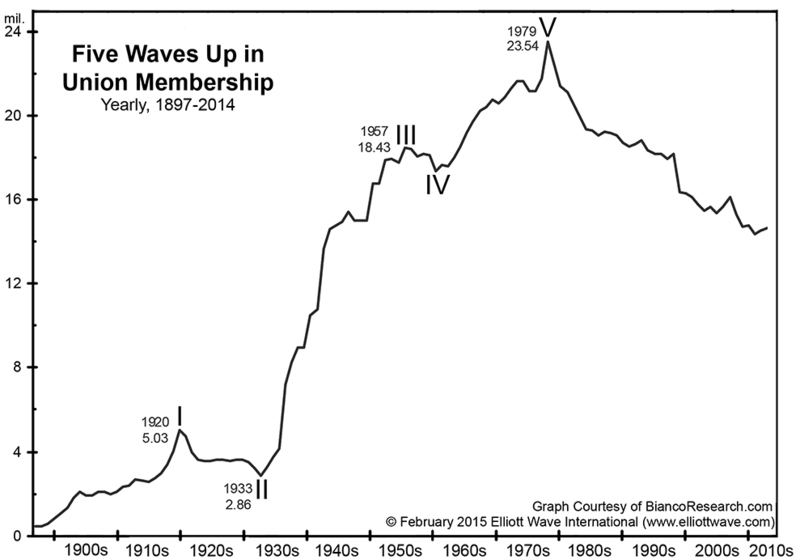 An online article on the decline of union membership reports that economists have offered five different hypotheses to explain the change in trend that occurred nearly half a century ago. They are: company opposition to unions; self-destructive union demands that force hiring to go elsewhere; a rise in the percentage of employed women, teenagers and immigrants; a shift away from factory jobs to service jobs; and government mandates on employer behavior that have reduced the need for unions. Continue reading this article to observe an Elliott Wave pattern in the annual tally of homicides in New York City. Learn how the socionomic explanation of these trends differs drastically from that of an economist or sociologist.